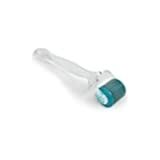 Sales order "Skin Roller .5 mm"
Great for Personal and Professional Use. A Numbing cream is Highly Recommended if you have very sensitive skin. A non-surgical treatment solution of Alopecia (Hair loss/Baldness), acne/surgical scars, skin whitening, improves skin pigmentation, improves wrinkles, Collagen Induction, and Active ingredient delivery. A convenient solution for many problematic skin conditions, while serving as a versatile non-surgical treatment alternative, with no known negative side-effects. With high strength stainless steel microneedles offer 1.0mm layer penetration within the skin or scalp, to treat Alopecia (Hair loss/Baldness), promoting hair restoration, skin rejuvenation, as well as a reduction in deep wrinkles and acne scars. Can be used in conjunction with hair re-growth (Minoxidil) or wrinkle reducing treatments to enhance absorption and effectiveness of indication. The microneedles penetrate the skin at 1.0mm to induce your body’s own collagen production in the dermal layer. Collagen is a protein and major component of tissue and cell structure, with responsibility for skin strength and elasticity. This skin penetration technology creates microneedle channels to further allow serums, gels, medications, or other form of skin treatments to infiltrate deeper into the skin layers for optimal absorption and effectiveness, thus increasing cell membrane and DNA regeneration. This microneedle technology solution will benefit cosmetic indications, by overcoming the epidermal barrier, and increasing effectiveness of topical skin treatments. High infiltration rate, increasing topically applied natural or medication absorption rate. An effective less-invasive treatment to promote new hair growth, avoiding expensive surgery costs and extreme side effects which accompany it. Promote new hair growth in 3 months. It can be used on sensitive or delicate skin, or any area indicating a thin skin layer. 100% of subjects treated with the Roller microneedle therapy in conjunction with hair re-growth (Minoxidil) topical solution experienced an increase in hair growth. The same study participants using the microneedle therapy skin system experienced an 80% reduction of hair loss compared to selective subjects without microneedle therapy. A less-invasive technique for skin and scalp rejuvenation without the expensive cost of surgery and excessive side effects which accompany it. A non-surgical treatment solution of Alopecia (Hair loss/Baldness), acne/surgical scars, skin whitening, improves skin pigmentation, improves wrinkles, Collagen Induction, and Active ingredient delivery. Recommended use: 2-3 times per week. Travels well, and can be used anywhere, even in the bath! Question by Raye: Is it bad to get a perm if you have alopecia areata? I am 17 and I have alopecia areata. Right now I have many bald spots on the bottom half of my head. I am so sick of having straight hair, it’s ugly if I just shower and go. I definatly don’t have enough time everyday to style it so I really want to get a spiral perm. Would It make my hair problem worse? The question about if it will make your alopecia worse would depend on what is causing it to begin with. If you have long hair and it covers the areas there should be no reason why you cannot get a permanent wave. If your hair were short then I probably wouldn’t suggest it as it make draw more attention to your patches. (The fact that you mentioned a spiral perm makes me belleve you have long hair). Ask your stylist, pending the cause of the original condition, it’ll probably be a green light.